According to a BlackBerry blog post, the unreleased app “caused issues”, that the company has been trying to resolve. The Android app has now been disabled, but customers who downloaded the BBM for iPhone app will still be able to use BBM. Although BlackBerry did not elaborate on the cause of these “issues”, security expert Graham Cluley suggested that BlackBerry may not have been able to cope with the spike of activity hitting its servers. “What seems, in part, to have tripped up BlackBerry is the poorly-policed free-and-easy Google Play Android app store, where multiple BBM apps, posing as official releases, appeared,” he said. Reimer noted that more than 1.1 million active users downloaded the BBM for Android app – albeit the unofficial version – in the first 8 hours after launch, indicating that demand for the Blackberry instant messaging service on other mobile platforms is high. However, the decision to pull the app is likely to knock consumer confidence in the platform, with users not knowing how long the service will be available for. The news follows BlackBerry’s announcement last week it will be laying off 40 percent of its global workforce – around 4,500 positions – and reporting losses of nearly $1 billion at its second quarter results later this month. The announcement will include a mammoth writedown of up to $960m, partly down to unsold handsets, and a $72m charge for restructuring. Though it’s long been considered one of BlackBerry’s strongest exclusive offerings, Heins said that his company aims to deliver a “fully featured” BBM experience on rival smartphone operating systems. “We’re starting with messaging and groups, but we’ll bring voice, screen share, and of course, channels later on,” he said. In a press release, BlackBerry notes that BBM’s successful move to iOS and Android depends upon the approval of Apple and Google. Assuming things go according to plan, BLACKBERRY’S KILLER APP WON’T BE AN EXCLUSIVE ANYMORE. The BlackBerry R10 is a yet unannounced device that is expected to become the third member of the BlackBerry 10 family, coming after the BlackBerry Z10 and Q10. The known specs include a QWERTY keyboard, 3.1-inch display with 720 x 720 px resolution, 5MP rear camera, front camera, 2GB of RAM, 8GB internal storage and a 1800 mAh non-removable battery. BlackBerry R10 will come with a mid-range price and it has a stylish QWERTY keypad and it will have a plenty of features and it has a beautiful design it beautiful, manufactured with fully plastic body and coming with complete accessories that are, BlackBerry R10 charger, BlackBerry earphones, data cable with sealed box available in black, white and red colors at affordable price in UK. There is no any announcement report of this phone but early it announce in UK and US. BlackBerry is going to announce a new smartphone with QWERTY keypad and it has 3.1 inch LCD and it will come with a latest RIM operating system know as BlackBerry 10.1 OS, 2 GB of RAM for better its performance and speed and 8 GB internal storage for store data and 5 MP rear camera embedded in this phone with HD video recorder and front camera is also available and 1800 mAh non-removable long life battery and many more features are includes in BlackBerry R10. Complete specifications and features are early coming soon. Display of BlackBerry R10 is not bad it has 3.1 inch LCD which runs in 720 X 720 pixels resolution and more display technology are attached with LCD but complete display information is not available now and it will be a great display and you can watch HD videos, movies and playing 3D games because the display of BlackBerry R10 is very graphical, bright and colorful and also running a BlackBerry 10.1 operating system which has a beautiful and modern icons, colorful themes and it’s a high class. display. The latest software is installed in BlackBerry R10 and BlackBerry 10.1 operating system software is running in this phone and it related with RIM because RIM is a official operating system of BlackBerry and the updated BlackBerry 10.1 OS has many features and apps and it support latest applications and some features of this software are HDR camera mode, smaller tweaks include the ability to paste phone numbers into the dialer, the option to disable alerts for specific applications and the ability to check for app updates more easily, PIN-to-PIN messaging within the BlackBerry Hub and an improved text selector are all likely candidates for inclusion in BlackBerry 10.1 OS, Dive much deeper and you will also notice more granular text selection and much more for entertaining and exciting features. A 5 mega-pixels rear camera will have a BlackBerry R10 for capturing pictures and you can shoot pictures in 2560 x 1920 pixels, it’s a high quality picture resolution and video recorder is also available for shooting videos in HD quality and camera features is also available. It will also have a front facing camera for video calls, video calls through Skype, communicate with peoples face to face and you can take your own pictures to the help of secondary camera. Regarding its release date, not much is known at this point, but we’ll make sure to bring you up to speed as soon as we have more information about it. 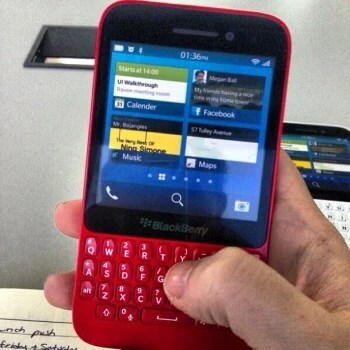 In the meantime, let us know in the comments section what do you think about how the BlackBerry R10 is shaping up? Interested in buying one? 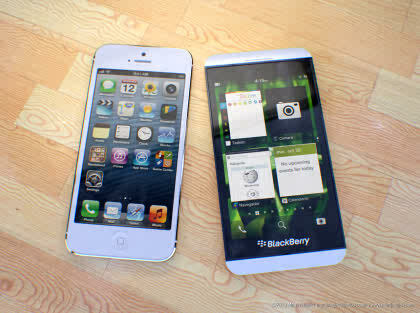 According to one website, the new BlackBerry Z10 beats the iPhone 5 in one specific area: its ability to be repaired. Tech repair website ifixit regularly takes computers, gaming systems, and cellphones apart and scores them based on their perceived repairability. Based on the site’s ranking system, the BlackBerry Z10 scored an 8 out of 10 in repairability (10 being the best), while the iPhone 5 was only given a 7 out of 10. According to ifixit, the BlackBerry Z10 earned a high score for the following reasons: The battery can be replaced without tools, the motherboard and display can be removed easily, and standard screws are used to put the Z10 together. The iPhone 5, on the other hand, uses uncommon screws, and many of the phone’s components are either soldered together or are combined into one piece, making repair much more expensive.